1 channel input, 4 channel output. The control of each channel loop can be configured via software. The maximum load current of a single channel is 3A, and the maximum load current of all loops of the module is 5A. 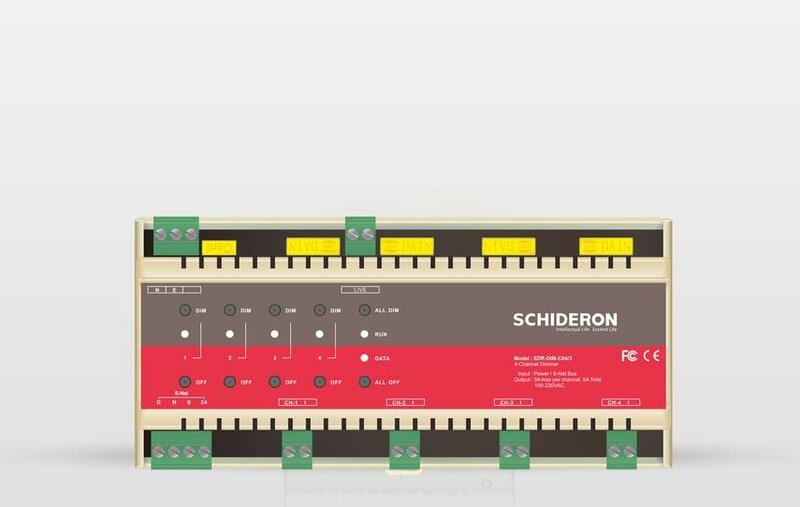 The module can be managed visually and centrally through SCHIDERON Intelligent Lighting Management System (LMS). The data of each channel in the module can be uploaded into the intelligent lighting management system for module data management and status analysis. Scene management is to pre-set the time for the module through the LMS, and then open the corresponding scene mode, to open all or part of the module loop. “Modular” equipment is flexibly installed and applied in the actual environment. The system is equipped with standard 35mm DIN rail mounting, providing convenient installation and maintenance for users. The module is designed for the MCU pure hardware architecture and has local data processing and channel control. The overall power consumption of the module is low and the task processing is timely. The module communicates via the bus to ensure the stability and reliability of data transmission. Each module has a corresponding physical address. The DIP dialer can be used to set the address of the module to ensure that each module can operate correctly and accurately receive and execute commands transmitted from the bus. The module comes with a relay in each circuit to ensure that the circuit can be completely shut down. The minimum and maximum brightness can be set by software. The module has a single-phase zero-crossing detection circuit. The proprietary zero-crossing filter technology makes each opening/closing action of the module relay at the zero-crossing point of the frequency, thereby prolonging the service life of the module, reducing the flickering of the lighting fixture, and compensating the circuit. Voltage and frequency fluctuations. The 4-way 3A Silicon controllable dimming module(SDR-DIM-C04 / 3) is used for front tangent electron low-voltage lamps(ELV), incandescent lamps(INC), neon lights / cold cathode transistors(Neon / CC), Electromagnetic low-voltage lamps(MLV) and other lighting lamps perform forward phase dimming control. The maximum allowable load current for a single channel is 3A, and the maximum allowable load current for all circuits of the device is 5A. The circuit independent control, pre-editing scene control and scene timing control can be performed by the intelligent lighting management system(LMS) visualization. The module data can be uploaded to the intelligent lighting management system(LMS) for module state management and data statistical analysis. The entire data transmission and equipment control is in line with the latest industrial industry standards.